Houses & Homes VA: Why are you WASTING 1/3 of the space in your home? Why are you WASTING 1/3 of the space in your home? Chances are you have a lot of extra space in your home that you never even think about. 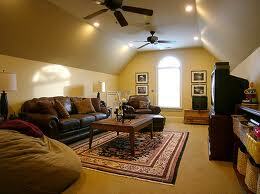 Today a lot of people are taking advantage of that unused square footage better known as the attic. You can do a lot more than you might think with all that wasted space and the truth is its almost silly not to! Why not add 25% - 50% more living area to your home? After all, you’re paying for it anyway. Here are some great ideas to get the most out of your home. What better place to retreat to than a huge master bed, bath and relaxation area? No part of the home could be more private and you gain an extra bedroom (your old one) for any other use that you see fit. A den, a home office, a spare bedroom or even a family room! Did I mention how nice it could be to wake up to the morning sun on all 4 sides of your spacious new sanctuary? Get the Kids Out of Your Hair! Look, we ALL love our kids, right? But sometimes there is something to be said for a little peace and quiet! Just imagine how thrilled your little angels would be to have their own private play space? They would have a place to keep all of their favorite toys and you could decorate the room to match their favorite characters or create a great color theme that they would love. When they get older you could turn the play space into bedrooms or even a “hang out” for them and their school buddies. Personally I would rather my children be where I know they are safe and just as importantly, I want t know who they are with. Wouldn’t it be great to offer visiting family or friends their very own private space in your home to enjoy? Teenage or college age children would benefit as well and of course if you have mom or dad (or both) staying with you, this could be the perfect solution. Another possibility is to create an additional income for yourself. It’s not terribly difficult to add outside steps and a separate entrance for a renter and it’s a great way to increase the value of your home as well. Enjoy that “Special Room” You’ve Always Dreamed Of! Come on, you know you’ve always wanted a billiard table of your own! How about an awesome home theatre or the perfect place for that model train system that you always wanted to display? The possibilities are endless and there must be something special you’ve always wanted to do if you just had the space. Well, now you do! Be creative and enjoy. After all this is one of the great benefits of owning your own home – the freedom to do whatever you want.